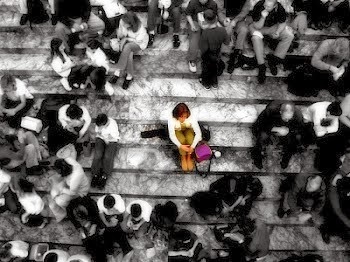 Have you ever wondered if your voice would be distinguishable amidst the crowd of written noise. That if your future self had written something, would yourself from the now recognise it as your own? Like a mother recognises her baby's cry. What makes our voice uniquely our own? And is the writing a portrait of the writer? I'm not going to answer these, because I don't know the answer. I'd like to think that I would recognise my own writing, but would I? looking back at some of my old journals I'm now not so sure that I would. I am no longer that same person. I can clearly see the influence of writers that I had been obsessed with at the time, though at the time I wouldn't of seen that at all. It makes me think now, what writers are influencing me without me even realising it? Will I look back in five years and say how blind I'd been to the impressions of others that I'd been reading? It seems strange at how others writing have influenced my personality so completely. 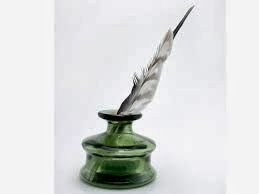 I want to write my my own novel, I feel like I already have, I'm a good way into the second draft. I suppose whats been stalling me is that every time I go to write it I question if I will do the story justice. Like I'm afraid that I'll mess it up before I even really begin it. I want it to be at least on the same level as it is in my mind. I picture it so vividly that I want others to see it like I do. But whose to say that others will like what I see? I feel like I should at least give them the option. I want, this year, to stop procrastinating. To finally make some headway, and give more shape to my beginning.